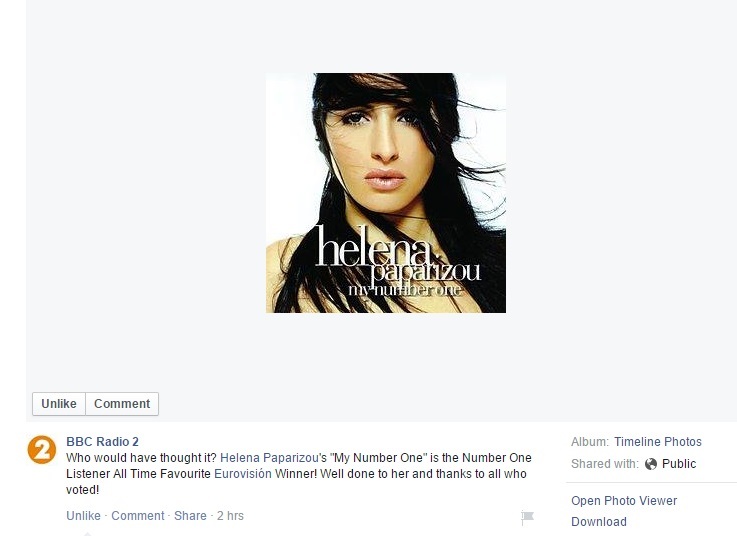 My Number One has been voted the number one ultimate Eurovision winner by a poll on BBC Radio 2. This was a poll that surveyed Eurovision fans worldwide on who their all time favourite Eurovision winner is to mark the 60th contest. This is a great honour for Helena to beat out some of the newer and biggest names in Eurovision history such as Loreen and Conchita Wurst. BBC Radio 2 is one of the BBC’s national radio stations and according to listening figures, is the most popular station in the United Kingdom. Radio 2 broadcasts throughout the UK on FM between 88.1 and 90.2 MHz from studios in Western House, adjacent to Broadcasting House in central London. Programmes are broadcast on DAB digital radio, TV and Online. There has been mixed reactions from the general public on this. Quite a bit of backlash. OMFG THAT IS HUGE! CONGRATS! Derek wrote: OMFG THAT IS HUGE! CONGRATS! We are not THAT many (and that includes her Greek fans). My Number One has just always been huge amongst eurofans and here's the best proof!